A Dhani Jones personal appearance, Dhani Jones speaking engagement, or Dhani Jones endorsement will reflect well on your company. To hire Dhani Jones now for any corporate appearance, fundraiser, motivational speaker event, personal appearance, autograph signing, or website endorsement please contact our celebrity agents at 1-877-6-SPORTS. We will contact Dhani Jones or contact Dhani Jones' agent and provide you with the booking fees and availability immediately upon your request. Direct Sportslink is the only sports speakers bureau and talent booking agency based in the United States securing only sports talent for corporations, associations, and organizations for motivational speaking engagements, personal appearances, and endorsements. We are the premier sports celebrity booking agency and a sports celebrity procurement expert. Accordingly, we will provide you with any relevant Dhani Jones website information and booking agent details so that you can hire Dhani Jones for your next event. Warrior and Bowtie Expert. 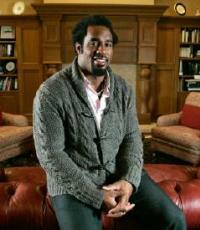 Linebacker, Poet and Jock: Dhani Jones understands the extremes of life. As a member of the Cincinnati Bengals, Jones would ride his bike to the stadium for practices & games, has worked with Al Gore's climate change initiative and is on Feeding America's entertainment council to end hunger. The well-spoken Jones, hosted DHANI TACKLES THE GLOBE. By actively participating in some of the most beloved national pastimes from around the world, Dhani discovers that sports have the universal ability to open a window into a culture; define a destination; and unlock a common passion in people that is as different as it is familiar. His huge love for living, authority on sport and understanding of the big issues of climate change make Dhani a key player in sport and sustainability. No wonder that in Hindi, "Dhani" means thinking man. In 2005, he began www.fivestarties.com. Known for wearing his signature bow tie, he designed his own modern line of fun and high quality men's accessories. Other interests include: Art/Photography, Poetry and Reading, and Music. At the University of Michigan, Dhani Jones was a three time All-Big Ten honoree. As a sophomore, Jones started nine games at linebacker and finished second on the team with 90 tackles and six sacks, playing alongside Heisman Trophy winner Charles Woodson on Michigan's 1997 national champion squad. As a junior in 1998, he started at linebacker and finished with 72 tackles. Lining up at strong side linebacker as a senior in 1999, he finished second on the team with 81 tackles. After being drafted by the New York Giants in 2000, the Philadelphia Eagles acquired him from the Giants in 2004. He started in Super Bowl XXXIX. After a stint with the Saints, he signed with the Bengals in 2007 and retired in 2010. Based on your interest in Dhani Jones as a speaker or for a personal appearance, Direct Sportslink has provided you additional links below for other sports talent with similar appearance fees, speaker topics, and categories that match Dhani Jones.